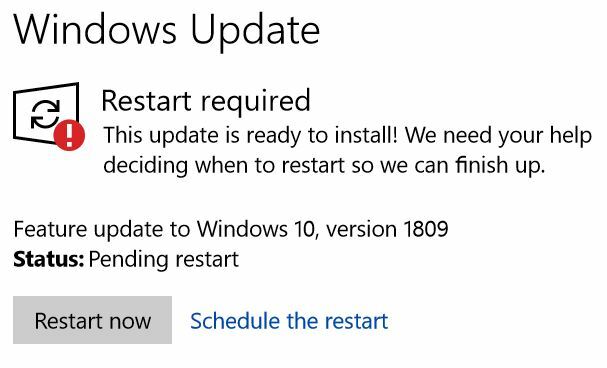 My Semi-Annual, targeted, no deferral, test of when 1809 would be offered up to my Lenovo X1 Carbon finally got offered up 1809 tonight. It was deferred due to my having installed iTunes/iCloud on this computer and Microsoft putting in a block until the issue was resolved. The offering still feels awkward and less than ideal. I think it would be better if there was some way to pick a date on the calendar not have the pc suddenly pop up a “hey I want to reboot, is this a good time?”. Well it’s time for bed, I’ll let this reboot and see if everything works tomorrow. Past rebooting on this machine has lost the Lenovo Display port functions (I use this PC to watch things on a TV), so I’ll report back as to what happens. Edit 2/23/2019: Got by Bluetooth back by doing a hard shut down of the operating system. Reinstalling the driver wouldn’t do it. I found the solution by googling here. I had to hold the power down (basically do a hard shut down) and THEN the Bluetooth came back. Edit 2, apologies, I should have said semi-annual targeted. Meaning normal consumer, no deferral. I was waiting to see how long it would take this decent laptop to get 1809 offered up to it.